ARMSLIST - Everything You Need, Nothing that You Don’t. It’s unclear who first used the phrase “Everything you need, nothing that you don’t” to justify the features on his handgun. I like to think it was someone attempting to explain an expensive gun purchase to his/her spouse. 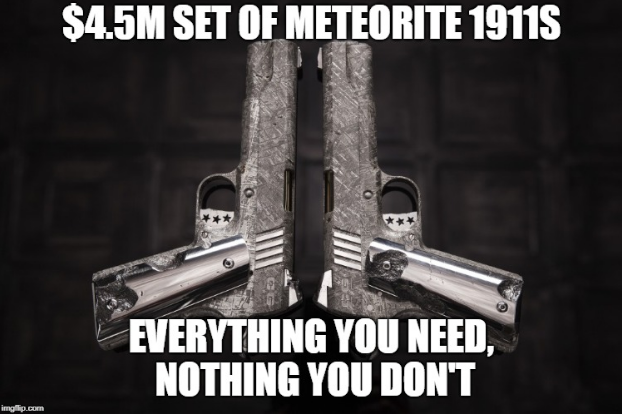 Regardless, it may be one of the most frequently repeated marketing phrases used in the firearms industry, and has been applied to firearms as humble as Hi-Points and as lavish as $4K Wilson Combat 1911s. What do you actually need on a defensive handgun, and what do you not? Thanks to the 2nd Amendment, no one has a right to tell you what you do or don’t need in a firearm (many in our own government try to anyway). Unfortunately, most of us have to function within limited budgets, so we have to separate our “needs” from our “wants”. So what should fall into the “need” list? Jeff Cooper maintained that the only modifications his 1911 needed were a set of sights he could see, a trigger pull he could manage, and a light dehorning to remove sharp edges from the gun. You’ll likely find that your list of needs will evolve with your shooting skill and experience. Will a trigger that is 1 lb lighter make you more accurate? Do you need the latest corrosion proof super finish if you live in Wyoming? Will that custom stippling job keep the gun under better control than the stock texturing? Only you can answer those questions, and those answers will likely change with time. Tell us in the comments: what do you “need” in a self defense gun? Hahaha @ zrok!! Nailed it. The gun you carry is the one you'll use in a self defense situation. The weapon closest to you when self defense is needed. All other requirements are secondary. I'm a 1911 fan and have several nicer models, but I carry a $250 LC9s pro with painted glow sights. It's the gun I shoot best with on a quick draw and I can see the sights well day and night. My requirements: 1. A gun you can shoot accurately (sights and trigger) and 2. one you can replace at a reasonable price if it's stolen. Well, here goes. In the event you actually need to defend yourself and use deadly force, the last thing I want is a show piece gun. Something simple and reliable that I practice with often as to have good muscle memory. A calibre that can stop a man with 1 to 2 hits so that he can't shoot back accurately, and hopefully dispatch humanely. Last of all, one that I wont mind having a case number vibro peen etched in it after the police investigation. Still available? I'll give you $400 CASH today. -- most Armslist shoppers.